After this week's Boösaule Montes post, I thought it would be good to do a more general mountain post. I actually think I will write up a few such posts. This first one will discuss common features seen among Io's more than 150 positive-relief features. This post is based on discussion of this topic in "The mountains of Io: Global and geological perspectives from Voyager and Galileo" by Paul Schenk, Henrik Hargitai, Ronda Wilson, Alfred McEwen, and Peter Thomas. This paper was published in the Journal of Geophysical Research in December 2001. Perhaps the most common attribute of all mountains on Io are that they have experienced some form of degradation. In other words, no mountains appear prestine, despite the relatively young age of Io's mountains. Assuming an average deposition rate across Io surface of one cm per year, every part of Io's surface should be covered in ten km of material in one million years. Ten km is more than the average height of mountains on Io, so most mountains are probably younger than that. Degradation of mountains comes in the form of mass wasting which can take several forms. First, slumping on steep slopes can dislodge large blocks down slope or form thick, fan-shaped deposits. The latter case was mentioned before at Boösaule Montes "South". Slumping on shallower slopes, like on the top of Hi'iaka Montes "North", can form ridges perpendicular to the direction of slumping. The ridges are crumpled up material from the upper layers of the plateau. In other cases, long-runout landslides can result from more rapid mass movement of material. These can form deposits a few-hundred meters thick that can reach as far as a couple hundred km from the mountain. A third form of degradation is sapping. Sapping a geologic process by which volatiles exit a slope, usually as a groundwater spring on Earth. On Io, because there is no air pressure to speak of, this process is much more explosive. Sapping is thought to create the spur-and-gully morphology seen on many Ionian plateaus, as seen at Tvashtar Mensae at left. While the sulfur dioxide sublimates away during the explosion, more solid materials is transported downslope, forming deposits a couple hundred meters thick. Again, you can see the leading edge of this deposit at Tvashtar along the bottom right side of the image. At some mountains, sulfur dioxide is released without apparent erosion but instead leaves a bright deposit of frost. 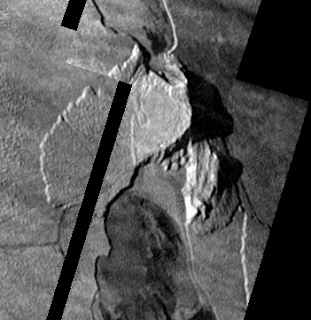 This is particularly common at mountains in Io's polar regions, like Haemus Montes, but has been seen in action closer to the equator, such as at Pillan Mons. 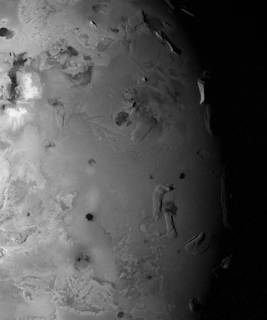 Certain structural features are commonly seen on Io's mountains. For example, striations, representing either pre-existing layers in Io's crust or fault lines from imbricate-style faulting produced during the mountain's uplift, are seen at several mountains such Haemus Montes. Another common feature is central rifting. 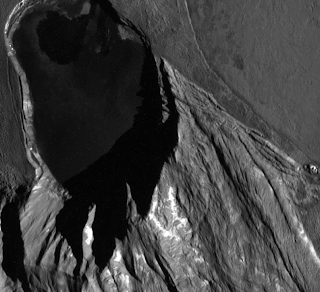 In this case, the mountain appears as if it has been split apart with a canyon running down the long axis of the feature. This was seen at Boösaule Montes "North" in the earlier post but can also be seen at other mountains such as Pan Mensa and Danube Planum. Many mountains have structural similarities. There are the low plateaus: relatively flat mesas with smooth or rough top surfaces and steep basal scarps (that are often arcuate as a result of sapping). These plateaus are often two to four km in height. Another interesting mountain type is the double ridge. These mountains have two parallel ridges with a central valley in between. Two examples of an Ionian double ridge include Ionian Mons and Mongibello Mons. Another mountain type is the flatiron, as seen at Gish Bar Mons above. Flatiron mountains have an asymmetric profile, with a relatively shallow slope on one side and steeper, more rugged slopes on the other sides. Schenk et al. 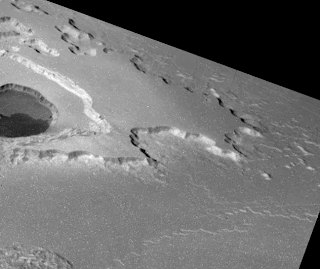 surmise that these mountains are produced by thrust faulting with the smooth slope representing the formerly flat surface and the steeper slopes revealing a cross-section of the upper lithosphere of Io. These are the tilted crustal blocks highlighted in Schenk and Bulmer 1998. A final common trait among Ionian mountains is their proximity to volcanic depressions, known as paterae, despite not being volcanoes themselves (with a few rare exceptions). An example of this is Gish Bar Mons, whose southern flank is also the northern rim of Gish Bar Patera. According to Schenk et al. 2001, 30% of mountains on Io have flanks within 5 km of paterae. 10% of paterae, according to Radebaugh et al. 2001, lie next mountains. One reason for this correlation may be that magma exploit weaknesses in the crust, including faults associated with mountain building. This process then leads to paterae formation, which if Keszthelyi et al. 2004 is correct, would involve the formation of volcanic intrusions in the upper layers of the crust which then drive off volatiles in the crust above the intrusion and melt the rest, until a depression is formed down to the level of the sill. In the next Mountains post, which I will try to post sometime later this week, we will look at what the distribution of mountains on Io can tell us about Io's crust.